There are many marvelous things in the world and custom design jewelry is definitely one of them. People enjoy the finer things in life and there is no reason why you cannot afford those things, especially with technology making it easier and easier for you to invest in such a piece of jewelry. Custom design jewelry is all handmade jewelry so if you have zero patience for things, this process is not for you. 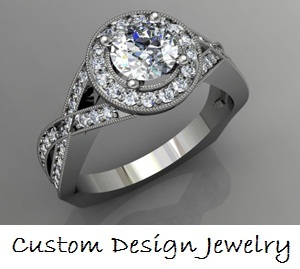 It will take some time for you to gather your thoughts and ideas in order to get the ball rolling on this design and it will also take a while for your jeweler to fabricate this item. It should not be rushed at all. The initial phase will involve you gathering pictures of rings or bracelets you find attractive. You should point out specific aspects of the items to your jeweler that you want to incorporate into your new piece. This will take some time, but it is essential you both get on the same page when it comes to the design. After you are on the same page, your jeweler will then create a three dimensional computer drawing for you to approve. This will eventually be the final product when he or she is done making it!